When the film was processed by a commercial developer in New York, five of the exposures showed nothing but sea foam. But the sixth showed the ghostly faces of the dead seamen.. There's a third face in the middle between the others. I have seen it before in a ghost book I have and saw it then. Do you see the other face? Do you see the face in the middle? If you check other reproductions of this photograph on the Internet - there are quite a few - you'll notice minor variations. Some, at least, have been retouched, probably to make features clearer. (Go on, check them!) I can't help wondering what the original print showed. This is a good one cause its an original lol. I remember seeing this in other books and it looks ligit. I've seen this one before, it is a great representation. I also believe it to be genuine because of the age of the photo. there's no room for photshop here! Just a note: i was reading that the human mind will create images that make sense to us in order to process the visual information we are getting. in some cases, i think this applies - in this case however, i truly believe that we are seing the faces of these poor lost men buried at sea. This is pretty weird. Well, maybe its just a game of light and shadows. But who knows. They are lost souls now. 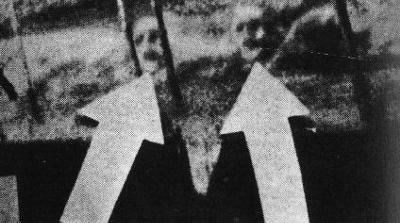 I think this is one of the most interesting ghost photos out there. Woah dude. That's weird because it's like a long lost spirit is in a boundary or something. Get on wolfy. Thank you for sending in these historic photos and telling the story behind them. What a great addition to the site!